Texas Southern at Oklahoma — Fox Sports Net/Fox College Sports Central, 6:30 p.m.
Georgia Tech at Georgia — SEC Network, 7 p.m.
Creighton at Nebraska — FS1, 7:30 p.m.
Rice at Texas — Longhorn Network, 7:30 p.m.
Oregon at Oregon State — Pac-12 Network/Pac-12 Oregon, 8:30 p.m.
Cornell at Syracuse — ESPNU, 6 p.m.
Georgetown at Loyola (MD) — CBS Sports Network, 7 p.m.
Ohio State at Penn State — Big Ten Network, 5 p.m.
Ohio State at Penn State — Big Ten Network, 7:30 p.m.
Road to Madden Bowl: Madden Classic — ESPN2, 10 p.m.
Live From the Masters — Golf Channel, 9 p.m.
Masters Highlights: 2004 — Golf Channel, 5 p.m.
Masters Highlights: 2014 — Golf Channel, 6 p.m.
Live From the Masters — Golf Channel, 7 p.m.
Tiger Woods: Return of the Roar — ESPN2, 8:30 p.m.
United States vs. Russia — NHL Network, 9 a.m.
Toronto at Boston — ESPN, 2 p.m.
New York Yankees at Houston — ESPN, 8 p.m. 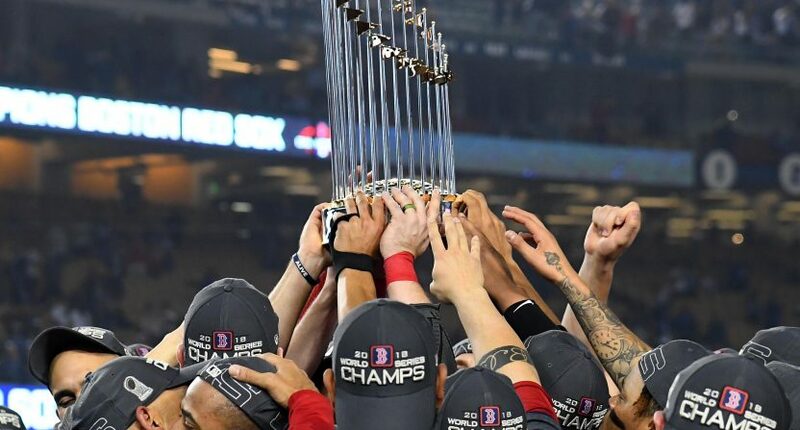 Baseball Tonight: Boston Red Sox World Series Ring Ceremony — ESPN, 1 p.m.
Dale Jr. Download — NBCSN, 5 p.m.
Boston at Washington — TNT, 7 p.m.
Houston at Oklahoma City — TNT, 9:30 p.m. The Starters — NBA TV, 5:30 p.m.
10 Before Tip — NBA TV, 6 p.m.
NBA GameTime — NBA TV, 6:30 p.m.
NHL Draft Lottery — NBCSN, 8 p.m.
NHL Tonight: Eastern Conference Playoff Preview — NHL Network, 6 p.m.
NHL Tonight: Breakdowns & Demos: Best of the Regular Season — NHL Network, 7 p.m.
Hockey Central: 2018-19 Playoff Preview — NHL Network, 9 p.m.
TSN Hockey: Playoff Preview Special — NHL Network, 11 p.m.
Ligue 1 Highlight Show — beIN Sports, 4 p.m.
Univision Deports Fútbol Club — Univision Deportes, 6:59 p.m.
Fútbol en Serio — Univision Deportes, 10 p.m.
SportsCenter — ESPN2, 1 p.m.
Fair Game With Kristine Leahy: Kenny Clark & Jason Brown — FS1, 5:30 p.m.
1st and 2nd Rounds — Tennis Channel, 4 p.m.
Tottenham Hotspur vs. Manchester City — Galavision, 2:30 p.m./TNT, 2:55 p.m.
Liverpool vs. FC Porto — Univision Deportes, 2:30 p.m.
UEFA Champions League Magazine — Univision Deportes, 1:30 p.m.